So, you’ve heard of gas smokers and charcoal grills and now you keep hearing about pellet grills and pellet smokers. In short, they are one of the best things to hit BBQ in a long, long time. 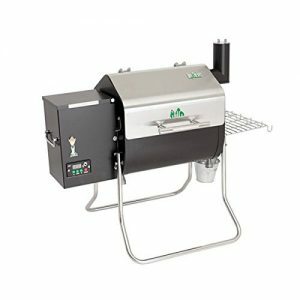 We’re going to go over the best pellet smokers (or best pellet grills, the terms are generally interchangeable and they are normally marketed as grills but some lack the ability to grill how you’d normally expect) that you can buy for your money. We’ll take you through what a wood pellet smoker is, round up the best pellet smokers with some nifty pellet smoker reviews and give you a quick run down of what smoker pellets you can buy. 1.1 What is a wood pellet smoker? 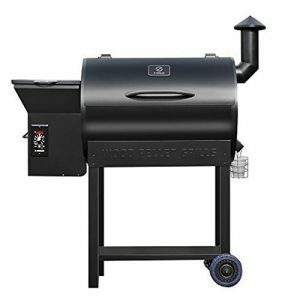 What is a wood pellet smoker? A pellet smoker is a normal grill that can be used for smoking, but that is heated by using small, high energy wood pellets. 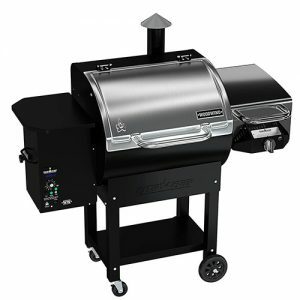 They generally have a digital controller built in that monitors the temperature inside the grill and then automatically feeds pellets into the fire pot to keep the smoker at the desired temperature. The reason why these grills are so popular is because they offer the classic wood smoked flavor without the inconvenience of tending to the grill. They are the best option in set-it-and-forget-it grills around today. Wood pellet smokers work by having you set a temperature on the digital controller that you would like the smoker to remain at. A standard household outlet gives the digital controller it’s power. The controller then sends a signal to a rotating auger that delivers the pellets from a hopper to a fire pot that houses the igniting rod. This igniting rod is just hot enough for the pellet to begin to smoulder and smoke. The heat and smoke is then evenly dispersed through the smoker in a few different ways. This can be by a fan or diffusion plates. 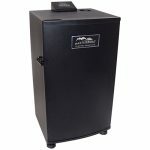 We believe that the Green Mountain Grills Davy Crockett Pellet Smoker is the best low budget smoker you can buy. It features a lot of interesting design choices that many of the higher end models simply can’t include. For example, the Davy Crockett is fully portable, it has well designed legs that can fold up to be used as handles for transport. It is also fully tailgate ready and again the design of the legs make it a perfect fit for most trucks. However, the Green Mountain does have some features that some of the high end pellet smokers have. For example, it has a WiFi system that allows you to monitor the grill from your phone or tablet. Initially we thought this was a bit gimmicky but the ease of use and ability to check on what’s cooking from anywhere has won us over. Also, the Davy Crockett has a temperature increment of 5° which allows very precise cooking and isn’t featured on any of the other low budget models. Advanced touch pad controller with an integrated meat thermometer that makes checking the internal meat temperature as easy as flicking a switch. 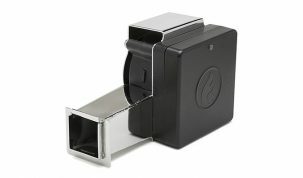 Included adaptors so you can run it from a standard outlet or a 12V battery or cigarette lighter. 219 square inch cooking area. Overall this would be our choice if you’re looking for a first time wood pellet smoker or a smoker for camping or tailgating. There is very little to fault it on considering the price. Our only complaint is that it simply might not be big enough for your needs. But if you’re happy with the 219 square inch cooking area then this is definitely the best pellet smoker you can but if you’re on a budget. Check out our full Traeger Junior Elite review for more information. Traeger was the company that started the whole revolution of pellet smokers so you know their products will be some of the best. 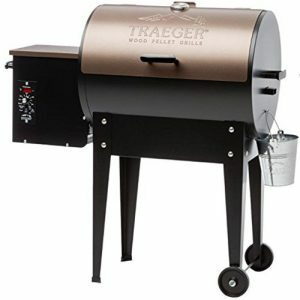 For the budget category, the Traeger Junior Elite Grill makes it into the alternative spot. This is a strange one because the Junior Elite is our least favourite out of the Traeger Elite series of pellet grills, but it’s the only one that has made it onto the list. This is simply because there are so few budget pellet smokers that are worth your time. The Junior Elite is a relative small pellet smoker that would make a nice addition to any garden. It is portable but not to the same degree as the Davy Crockett. It produces great quality meat and is very simple to use. The digital controller works well and takes the effort out of the cooking. The Junior Elite has a nice sized cooking area at 300 square inches. This makes it noticeable bigger than the Davy Crockett. There have been reports of problems with the build quality and the wood pellets running out during cooking. We didn’t experience any problems with the quality but did have to top up the pellets when cooking a brisket. Not a huge problem but it does take away the set it and forget it aspect that makes pellet smokers so desirable. If for some reason you can’t buy a Green Mountain Grills Davy Crockett then this is a worthy alternative. Read our full Camp Chef SmokePro Review for a more in depth look at what makes it so good. 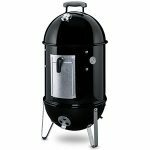 The mid range pellet smokers are a very nice balance between features and price. And the most feature rich mid range pellet smoker is the Camp Chef SmokePro DLX Pellet Grill. The SmokePro does all the basics very well. It produces fantastic quality meat simply and easily with a large cooking area of 573 square inches. It has great build quality and is easy to assemble with a large hopper capacity of 18lb of pellets. But what the SmokePro does best is the small quality of life enhancements that Camp Chef have introduced. It has an ash removal system that makes cleaning out the ash an absolute breeze, one of the very few models on the market to include one. In addition to this is a pellet bin clean out that makes sorting out the pellets much easier. A meat temperature probe built in. Dual LED readout for toggling between cooking temperature and internal meat temperature. 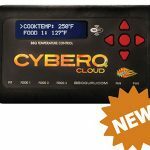 Low temperature settings if you want to produce more smoke to give that perfect smoke taste. If we were to buy one for ourselves this one be the one. It’s not too big and the price is just right, but it has many features that make using it far too easy. It’s a true set it and forget it and with the ash removal system, cleaning up has got a whole lot easier. Just pipped at the post to the best mid range pellet smoker is the Z-Grills Wood Pellet BBQ Grill. 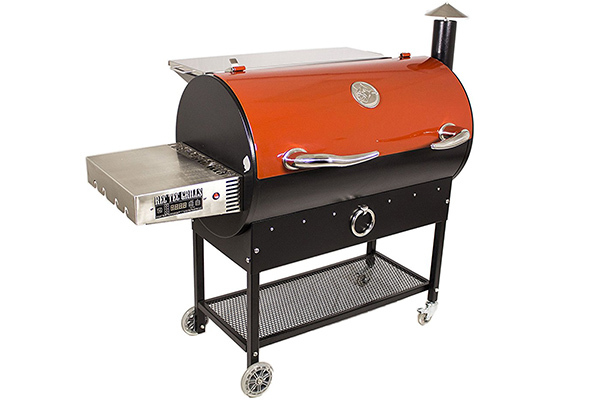 This is an all round great smoker that produces fantastic tasting meat and has a great build quality. 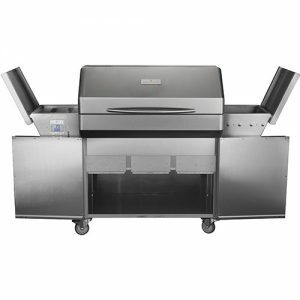 There is a total of 700 square inches of grilling area and a 20lb hopper capacity. Both of these are better than the Camp Chef SmokePro. What it’s missing though are the little extras that make the SmokePro so good. It has no ash removal system and is missing a built in temperature probe. They aren’t massive problems but once you’ve had them you can’t go back to living without them. High quality, heavy duty, all terrain wheels and rust proof cover and racks. Comfortably maintains temperatures from 175°F (79°C) to 500°F (260°C). What the Z-Grill has going for it, though, is that it is usually cheaper than the SmokePro and comes with two bags of pellets to get you going. So, if you want to save a bit of money, have a little more cooking space, be able to fire it up straight away and aren’t too worried about the clean-up, then the Z-Grill is a great alternative to the Camp Chef SmokePro. You may have seen other sites and reviews raving about the REC TEC and that is for good reason! Out of all of the pellet smokers on this list the REC TEC is the one we like the most. The first thing you notice about it is its striking appearance. The red, powder coated, 10 gauge steel drum is only out done by the stainless steel bull horn handles and nose ring towel holder. It’s a great looking bit of kit that only gets better the deeper into it you look. The steel is of the highest quality and is matched by the construction. One of the worst things about cheaper smokers is that they tend to leak smoke and heat from joints and seams. What the REC TEC can offer to stop this from happening is that its seams are welded, caulked and powder coated to produce a perfectly sound main drum. The only smoke that leaves it is through the chimney or the lid. The quality continues to the inside where the grill grates are highly resistant stainless steel rods and the fire pot, drip pan and heat deflector are all stainless steel. You can tell that there has been an awful lot of thought put into the design because the REC TEC also includes a small light on the inside of the drum for night time cooking. They’ve though of almost everything. A 702 square inch cooking surface with 9 inches of head room for up to 3 turkeys at once. Excellent digital controls with the ability to easily see the inside and intended temperature with the push of a button. Accurate temperature controls with increments of 5° at a time from 175°F (79°C) to 500°F (260°C). 40 lb pellet hopper. This is one of the largest on the market and we love it because it means that you can cook anything without the worry of refilling. A central fire pot to ensure even heat distribution and reduce consumption of pellet to an average of 1lb per hour at 225°F. Very simple to season. Check out our guide on how to season your new smoker to make sure you season it correctly. The downsides to the REC TEC are few. One being the price, but for a pellet smoker of this size and quality you can’t realistically expect to pay much less. Also, cleaning and maintaining it could be easier and we’ve seen a few things on other models that would be nice additions, such as WiFi and included wire probes. But honestly these are barely noticeable and unless you’re reviewing many pellet smokers you’ll never have a problem. This is the best smoker on the list and is our choice for the best pellet smoker that money can buy. The REC TEC is a tough grill to follow but the Camp Chef Woodwind Pellet Grill does a pretty good job at staying competitive. It’s generally the cheaper of the two grills and offers a few nice features that the REC TEC doesn’t have. 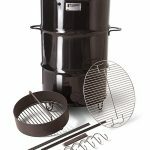 Firstly, as described in the Camp Chef SmokePro pellet smoker review it uses a patented ash cleanout system. This works just as well in the Woodwind and makes the whole cleaning process much easier. The Woodwind also includes a sear box that can reach temperatures of up to 900°F (482°C). A nice addition that wasn’t asked for but we’re happy to have. The Woodwind also has a similar smart smoke technology as the REC TEC that can keep the temperature and smoke levels exactly where you need them. 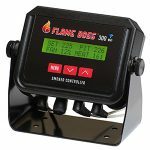 Huge temperature range of 160°F (71°C) to 500°F (260°C), plus the 900°F (482°C) sear box. Hugely versatile because of the sear box. You can arguably do everything on this grill and one of the major downsides to a general pellet smoker (bad grilling) is almost perfectly resolved here. Where the Woodwind doesn’t quite cut it for compared to the REC TEC is that the pellet capacity is much smaller at 18lbs, the grill size is smaller at 570 square inches, the build quality doesn’t feel as good and we found the controls to be less responsive as it’s still using a dial. Having said that, this is still a fantastic smoker. If you’re looking for an all in one pellet smoker with a sear box then this is perfect! We would highly recommend this but it is just beaten out by the REC TEC. 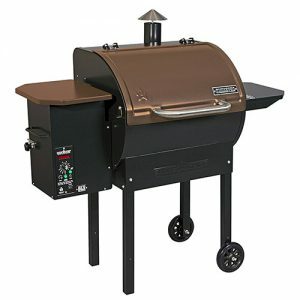 The Memphis Grills Elite is one of the biggest and best pellet smokers you can buy. It has a huge cooking area of 1252 square inches, dual convection fans and the best temperature controls we’ve come across. 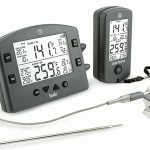 The Elite uses a touch pad PID controller that has built in times for cooking certain meats and a temperature range of 175°F (79°C) to 700°F (371°C). 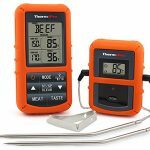 It has a build in meat probe and the smartest cooking options we’ve seen. For example, you can cook something at a certain temperature then drop the temperature after a set period of time to keep it warm without over cooking it. Good design and build using the best 304 stainless steel. Fully integrated WiFi so you can monitor what is cooking from anywhere with your smart phone or tablet. Double walled construction to ensure as much heat and smoke is kept within the smoker itself. Indirect and Direct flame modes to allow the full use of a grill. Shelves and a cart to allow it to act as a fully portable kitchen. Dual pellet hoppers to mix and match flavors. This is the ultimate pellet smoker and is absolutely perfect for use in a restaurant, at events or just in your garden if you want. It’s big and cumbersome but you get one of the best pellet smokers available. The biggest downside is the cost. It’s very expensive! But you get a whole lot of machine for that money. 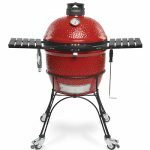 Pellet smokers are some of the most versatile pieces of BBQ equipment you can buy. They can barbecue, smoke, roast, braise, bake and sort of grill. They generally have a large temperature range, going from around 175°F (79°C) to 500°F (260°C). All pellet smokers, like gas grills and smokers will pre heat fast. This usually takes 10 to 15 minutes. A pellet smoker will deliver a very consistent flavor. Using the digital temperature setting will keep the temperature at the perfect level every time. Being able to set the temperature, usually very precisely, gives you the ability to cook the meat exactly right with very little effort. Pellet smokers are a great example of set-it-and-forget-it. You don’t have to stand around and babysit the grill all day. You just set your temperature, choose your favourite flavor of wood pellets and leave it to do all the hard work. Different flavors of pellets give you so many more options with no extra effort. You can get a range of flavors such as apple, cherry, maple, hickory, pecan and bourbon. The pellets can be changed over or mixed up to give you a huge potential canvas of flavors that are waiting to be tried and experimented with. Check out our ultimate guide to smoking with wood. Pellet smokers are dependent on electricity, limiting their portability unless you have access to a generator or inverter. This will also add to the costs, but it won’t increase your electricity bill like a fully electric smoker does – we looked at the best electric smokers here. Pellet smokers are relative expensive. We think the price is always justified but they tend to be more of a premium product. You generally don’t get a proper grilling experience from a pellet grill. The higher end ones can grill just fine, but some of the cheaper smokers struggle to leave the grill marks or sear the meat. This is due to the fan driven indirect heat that cooks the meat, rather than traditional open flames or coals. The higher the cooking temperature, the less smoke the unit generates. To get the most smoke flavor it’s best to use temperatures below 250°F (121°C). 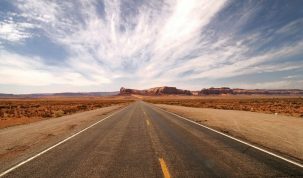 As with anything, the addition of digital technology and extra moving parts increases the likelihood of failure. This is something that charcoal grills are not encumbered by. Wood pellets can disintegrate if exposed to moisture and must be kept dry. Smoker pellets are the key to a wood pellet smoker. They are cylindrical food-grade wood pellets that are about a ¼ inch wide. They are usually made of compressed hardwood sawdust that has been heated and squeezed together so tightly that the natural glue in the wood binds them together and holds the desired pellet shape. Unlike charcoal, pellets don’t contain any additives or fillers and burn surprisingly clean and efficiently and produce remarkably little ash. The added bonus of pellets is that they come in a range of flavors that can be mixed and changed over during cooking to give a potentially huge variety of flavors. Wood pellets aren’t only useful in smokers. If you’re a proud owner of a pizza oven they make a great fuel source for smokers and certain makes of pizza oven. One such pizza oven is the Uuni, which is run exclusively on wood pellets. 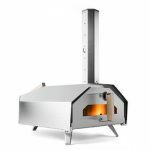 We took a look at the best wood fired ovens available today. BBQrs Delight Wood Smoking Pellets – if you want to try a variety of flavors. 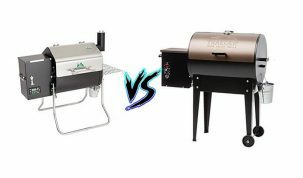 Hopefully this has helped you decide which pellet grill is for you, if you still need help then feel free to comment below or connect with us on Facebook.